The market of metal laser cutting machines is undergoing considerable growth, thanks to the cost optimization and refinement of the technologies involved. Laser cutting technology is now, not only more efficient and accessible than in previous years, but an optimal alternative to traditional production systems such as punching & mechanical presses. Laser Cutting is also applicable in more applications than ever. Dallan has always been up to date with the technology innovations that meet the widest needs of the market, while also manufacturing lean and highly efficient production systems. For more than 40 years, we have been developing & manufacturing both automated roll forming lines & automated CNC hydraulic & electric punching lines, all starting from sheet metal coils. Thanks to our technology, engineering and lean manufacturing principles, we produce machines that guarantee maximum efficiency in productivity and resource optimization. In fact, “coil processing” optimizes raw material utilization (up to 100%) and increases the productivity for the entire production cycle. In 2011 our R&D department started to develop the laser cutting technology that joined Dallan’s more than 40-year experience of machine building & our coil processing philosophy. The idea is to merge the efficiency and the flexibility of laser cutting with the productivity of producing from coil. In 2014 Dallan presents its first (combo) laser cutting system at international Euroblech show in Hannover, Germany. Dallan roll forming & CNC punching production systems have always been unique in the efficiency, quality and precision of output. 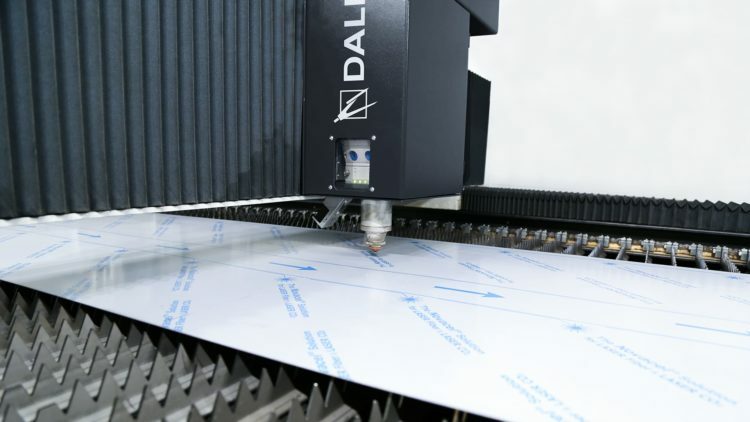 For this reason, during the development of the Dallan laser cutting systems, we have implemented these unique productivity features & technologies into the project’s core. First, we decided to develop a cutting system with a wide working area for the processing of the coil fed material. The laser cutting head then moves to perform the programmed cuts in the enclosed area. The coil fed sheet is stationary while being cut to ensure the best accuracy inside the work envelope. After the cutting is finished, the coil fed sheet can be either cut off and exited from the work area or be fed continuously through the work area if the part is longer than the work area. In order to guarantee the highest precision on processing very long parts, Dallan developed, patented and implemented the “Laservision” technology (that is based on images processed by a camera). This solution allows us to reposition the coil fed sheet by referencing the pictures taken by the camera and guarantees an accurate positioning for long parts and adds several exclusive competitive advantages. Dallan laser cutting systems are available in several versions; based on the thickness, width and type of material to process. The models differ in maximum width (from 50mm to 1500mm), and also the length of the working envelope (from 1000mm – 2500mm). Dallan “Laservision” technology allows the precise processing of parts up to 12 meters long, thanks to the high definition camera, shooting images in order to capture & analyze the data. Then uses this data to calibrate the material location for precise cutting at all times. The camera is positioned on the cutting head and it moves across the entire working area. Through the images captured, the software analyzes the material surfaces and finds the border’s position and any reference holes…etc. Once the system finds the reference points (borders or reference holes), the software defines the shape and the exact position in order to manage the further cuts with a tolerance of +/- 0.1mm. With this solution, a 4 meter long cut will have the same cut quality as much smaller parts (without sheet repositions). Dallan “Laservision” technology has several advantages in terms of precision and production flexibility, allowing you to optimize the production strategy by the operator based on type of production and product. How? By our exclusive feature that offers a high level of flexibility by processing the material from either coil or from standard sheets. In fact, every Dallan laser machine is equipped with this (easily) removable roller conveyor that is used to feed the machine with standard sheets. We feel this is the best way to alternate between small and big production lots. With Dallan laser cutting systems the operator has the possibility to choose between different production strategies when programming the machine, based on the product’s characteristics and lot to produce. Each configuration is based on the type of detection and measurability of the material inspected by the vision system in the working area. It is possible to set up different programs working on the two variables of precision and flexibility. This strategy is fit for the production of precision parts with parts that are longer than the working area. This means the material needs to be incrementally moved through the work area for cuts along the entire length of the part. The software is set up for the camera to take 4 pictures from the positioned material in the working area. These 4 points allow the correct detection of the part and the precise positioning of the further cuts, also after moving or indexing the material through the work area. This is the best solution for the processing of parts with the same width of the coil (or sheet). The “Laservision” takes 3 reference points in order to speed up the material detection and maximizing the production flexibility. This solution is for parts that fit in the work envelope and using nesting to minimize scrap. It is possible to set up the system to maximize the productivity. In this case, the precision is gained by processing the parts without moving the material. Also, the photo detection time is optimized by taking only two references with the camera. The flexibility of machine programming creates the perfect strategy for every kind of production. Different solutions are achievable by mixing the above strategies we have just discussed, in order to find the optimal solution for each kind of product. In order to optimize and simplify production processes, Dallan has integrated several different technologies into our production systems. For laser machines, we have developed two ranges of products to satisfy the widest number of requests. In addition to the standard LXN machines, Dallan CXN combo systems are available and they integrate the most advanced technology for laser cutting, and also featuring an in-line CNC servo-electric punching machine built by Dallan. The “Laservision” technology is the core of the machine and the production line is set up with two in-line working areas: (1) the punching zone where pre-workings are processed such as holes, deformations and threads. (2) After the punching zone, there is the laser cutting area where the vision system detects the material location and reference positions, then calibrates the cutting head operations. In this circumstance, we have joined three different technologies together, taking sheet metal cutting variations and productivity to the highest level: (1) The efficiency and productivity of coil processing, (2) the power of punching and (3) the flexibility of laser cutting. Please note; with CXN systems, it is possible to feed the system both with coil or standard sheets. The operator/programmer can set up the vision system according to production type and the kind of material to be processed. 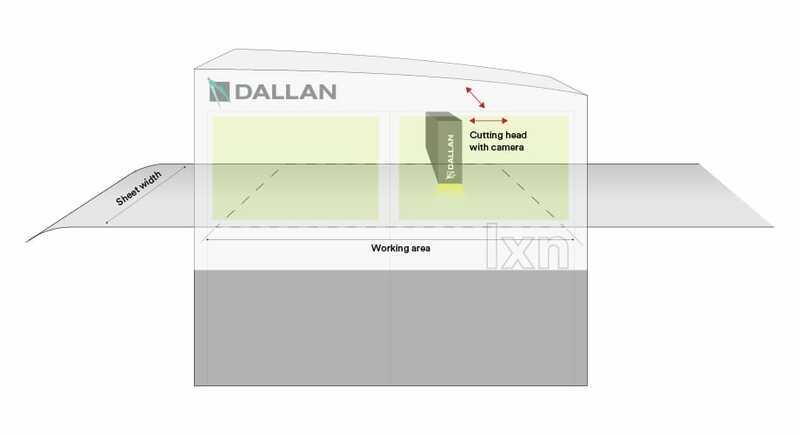 The Dallan “Laservision” system is based on images processing and operator is able to change the camera parameters such as exposure, contrast and brightness in order to adapt the camera to the material. The machine program is made by the CAD-CAM integrated software. In the same way, the vision system is set up for the shapes/features detection (through CAD-CAM) or directly with the shooting of the focused shape. In operation, the system detects the shapes and positions, giving the operator the level of correspondence, compared to the input information. LXN and CXN machines are first tested and approved on the Dallan premises (Italy) with the customer. Then the final installation is at the customer’s location and approved once again. At this time, the system is ready for the production. Then, we fully educate the machine operators in machine utilization and preventive maintenance of the equipment. When we decided to develop the laser application, we had the objective to build machines offering real advantages to our customers. Many of our customers have already purchased & tested our laser cutting systems. In many cases, the results have exceeded expectations, because Dallan systems are contributing to the success of their business through lean production process and raw material optimization. Read our case study history or contact our sales staff for a free advice.